Soon, the sun will be turning itself upside down, so to speak. 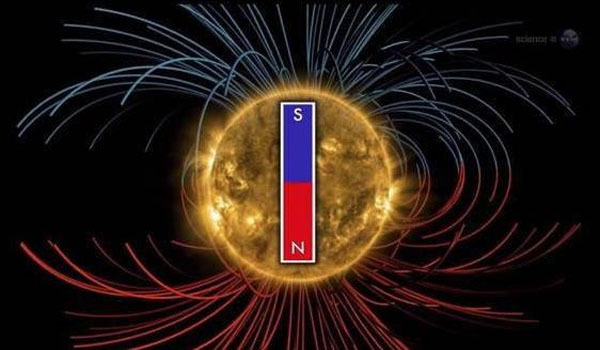 It’s currently at the midpoint of a long solar cycle, which means that its magnetic field will switch entirely: Positive will become negative and negative positive. Does that mean there will be any big changes for us humans, all the way out here on the surface of Earth, clinging to life thanks to the beneficence of the sun and the heat and light it provides? Eh, not really. But it is pretty cool, and there may even be some mild benefits to the switch. The sun operates on an 11-year cycle, created by all kinds of factors that scientists don’t entirely understand. Among them are the convection currents inside the sun that generate a magnetic field, basically like an enormous dynamo. Those convections inside the sun eventually force the switch. The most important effect will be changes in the shape of the sun’s current sheet, a thin layer of electric current that runs through the entire solar system, extending billions of miles past Pluto. That current sheet does lots of little things, including helping to protect the earth from super-fast, high-energy particles called cosmic rays. The current sheet has been relatively flat, but at the time of a polarity switch, it becomes wavy, offering some increased protection. Cosmic rays can damage spaceships and threaten astronauts. They may also have an effect on Earth’s weather, as some scientists think that cosmic rays play a role in cloud formation and lightning. However, he noted the theory linking cosmic rays and weather is a bit speculative. The Earth’s magnetic field is also caused by convection currents deep within the planet, and indeed also flips from time to time — roughly every 200,000 years. While scientists have noticed a small decrease in the strength of the Earth’s poles, they shouldn’t be switching for another 2,000 years or so. “The sky is falling, the sky is falling”!!!!! Be very afraid. . . . over something you can do nothing about. If it happens I hope I fry fast. well why in the entire hell are you all elaborating on something that’s not totally understood…and why is this a cycle that happens every 11 years, and now all of a sudden “houston we have a problem” thrown in the mix??? GTFOH already -_-….anything that happens in the sky before God gets ready to give us a show, will be due to the sick and demented humans we have screwing up the earth, and feels there is time for the ultimate false flag o_o.